Image 1 of 24. Click to view fullscreen. Create family memories that will last a lifetime at our beautiful and unique home. Located just 1 block off the water near the Park Shore Marina on Diamond Lake, our home provides access to a private beach to enjoy your summer days. 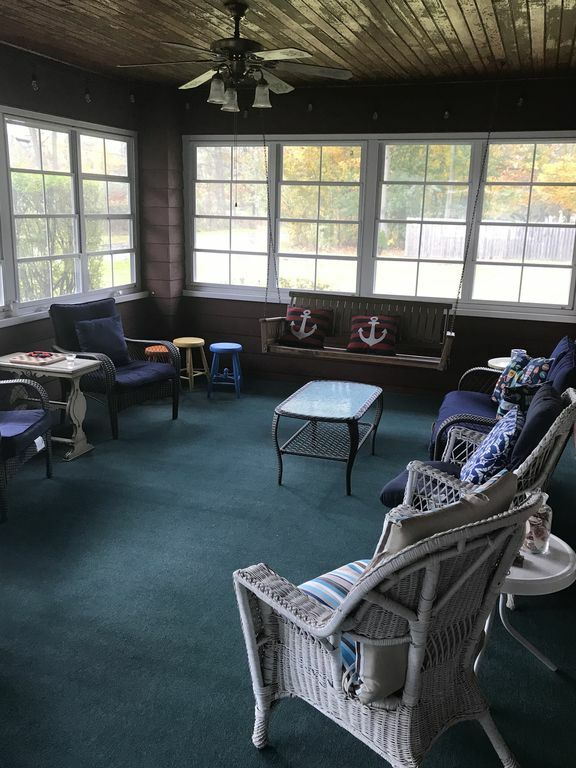 Originally built in 1891, the massive screened-in front porch will host your family and friends, provide a nap on the hammock, or dine by candlelight at the dining table. Our home has two spacious family rooms to relax in or watch TV. It has a complete modern kitchen with dishwasher, stove, oven, microwave oven, refrigerator and all small appliances. You can eat all meals in two separate dining areas, or take it outside on our expansive deck. Cook up your favorite BBQ on the deck with either our gas or charcoal grills. Enjoy a bonfire at the fire pit and toast marshmallows. There are two full bathrooms; one has a turn-of-the-century bathtub. All bedrooms have original antique porcelain sinks and ceiling fans. All bedrooms have original antique porcelain sinks and ceiling fans. The master bedroom has a king-sized bed; the middle guest room has a queen bed, while the back bedroom contains two sets of bunk beds. Both living rooms have sleeper sofas to accommodate even more guests! Steps away is the Park Shore Marina, where water sports rentals are available. They also rent pier space if you have your own boat or jet ski. There are two golf courses located minutes away from our home. We also have bicycles to ride to experience the beautiful area around Diamond Lake, southwestern Michigan's largest inland spring fed lake. Our family invites your family to experience our wonderful home and the many delightful memories that await. Our home is located just one block from the Park Shore Beach on gorgeous Diamond Lake.